In our previous tutorial we created an extensible animation system that allowed us to create discrete frame based image animation as well as other types of animations. This week we will continue on our quest to create an easy to use, extensible cross platform 2D game engine. In order to do this effectively we need to get organised and organised we will be. If you just want the code to this tutorial then download it from here. We want cameras that we can move around in our scene to view different parts of the scene. To manage all of the above we are going to create a Camera, Actor, Scene (CAS) system. The camera, actor and scene system (CAS) constitutes the logical implementation of our game engine. The scene represents our finite gaming world, whilst actors represent our individual game objects that live within our gaming world. The scene manages all of our actors for us, taking care of updating them and deleting them when they are no longer needed. The camera represents a view into the gaming world that can be moved around, rotated and scaled to view different parts of the world. Hmm, I agree, its a bit on the BIG side, but if you look carefully our CIwGameActor class provides a lot of functionality built in, which in the long run will save us lots of coding time. Again, you never create a direct instance of this class as it is abstract, you dervice your own different actor types from CIwGameActor. Object type identifier, object name (used to search for specific types of objects or named objects). These are very useful as they allow you to create actors and forget about them, no need to store a pointer to them to reference them later, you simply ask the scene to find the object by name or type to access it again. Note that eventually we will be replacing the physical components in this class with the Box2D physics engine. Update() – When you implement your own actor types you override this method to provide the implementation of your game object specific behaviour. For example, if you create a player actor then you may check and move the player, maybe fire of different animations / sound effects. The default implementation of Update() will update the basic physics for the actor, any attached playing animations as well as add the actor to the collision check list if it is collision enabled. You should call CIwGameActor::Update() in your own Update() implementation, if you want to keep this functionality. UpdateVisual() – You do not generally need to override and provide your own implementation of this method as this method will automatically update the actors associated visual for you. ResolveCollisions() – When the scene has finished calling all of its actor updates it will then call ResolveCollisions() on each of the actors. You provide the implementation of this method to check for collisions with other actors. We implement collision checking this way as it allows us to optimise which collision checks to make. For example, lets say we are creating the old game Asteroids. The scene consists of 10 asteroids, 10 bullets and our ship. Our ship actor only needs to check for collisions with the asteroids and not the bullets or the ship. One important note about Actors is there coordinate system. As far as our scene is concerned, the worlds centre is the the middle of the scene (0, 0), which corresponds to the centre of the screen for a scene that has not been moved. Our Init() method is pretty simple, it resets the actors internal data to default, creates a bitmapped sprite visual from the image and actor size then creates an animation manager and adds our default animation to it. Our UpdateVisual() method simply moves the image animation frame data to our sprite to update its image. The scene is the place where we put actors. When you add an actor to a scene the scene will take care of calling game logic update and visual update methods and building a list of potential colliding actors, as well as cleaning up the actors when the game is finished. Unlimited screen size – This method is quite complex and involves rendering enough stuff on screen at a 1:1 pixel resolution to cover the entire screen. This disadvantage (and advantage, depends how much time you have on your hands) of using this method is that you would need to display a much larger area of the gaming world on a higher resolution display than on a lower resolution display. Virtual screen – This method uses a pretend screen size that best fits many resolutions (800 x 512 / 512 x 800 is a good choice). Your game renders everything as though it is rendering to the virtual size and not the actual phones / tablets native screen size. You later scale and translate the virtual canvas to fit onto the native phones screen resolution. Ah much better, nice and short. As you can see the camera class is quite simple, supporting position, rotation and scaling of the view. To use a camera we simply create one and attach it to the Scene, the scene will then follow the camera around. To see different areas of the game world we simply move the camera around and all of our actors will move along with it. Cool, I’m now done with explaining the new classes. I’ve been battling with trying to keep this article short and to the point, but alas I don’t think its quite happening for me. I will be honest, A LOT has changed since the previous article and I will try my best to walk through most of it; this is the main problem with an engine that’s in-development. CInput – This class has been renamed to CIwGameInput to fit in with the frameworks naming conventions. CIwGameInput is now a singleton and not declared as a global variable (I’m not generally a fan of global variables and prefer to use singletons for systems that there will only ever be one instance of). If you do not know what a singleton is then think of it as a global instance of a class. Now onto the changes to Main.cpp. Note that I won’t be going into minor details such as “Oh I included these header files”. 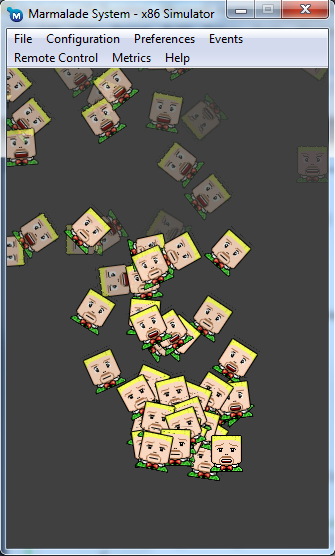 Next, we allocate a bunch of image animation frames for our manic face animation. Take note that we now allocate them through the game scenes animation manager. This ensures that the game scene later cleans them up for us. Note that because we are now dealing with a virtual screen resolution and not the actual native screen resolution, our tap coordinates need converting to virtual screen coordinates. We achieve that using the ScreenToVirtual() method of the CIwGameScene class. Also note that we still have to create our face_anim animation, but this time we pass it to the ActorPlayer Init() method, so that the actor / scene can take of its management. ActorPlayer is our very first user defined CIwGameActor based actor and because we derived it from CIwGameActorImage (and in turn CIwGameActor) we get all of the useful functionality defined in those classes. Our Init() method calls the base CIwGameActorImage::Init() method to initialise the base CIwGameActorImage part of the actor. We then set up a fade timer and random velocities for position and spin. Our Update() method is called every game loop by the scene system, so keep in mind that this code will be called every single game frame. Firstly we check to see if the fade timer has timed out and if it has then we return false to the the scene system (this causes the actor to be removed from the scene / game) after the scene has finished updating all actors. We then calculate the opacity of our actor from the time left on the fade timer which causes the actor to fade out of existence. I’m quite happy with this blog as it marks the start of a real usable cross platform game engine that we can now build upon. In our next tutorial we are going to cover upgrading the engine to include some very basic collision detection and response whilst building a small game using the engine to show working collision. We will also cover handling frame rate variations and putting some audio in there. Hopefully I will get the time to do that this weekend.